In 2010, a brand-new Audi model line made its debut in the shape of the A1. And now the second generation of the successful compact car is rolling to the starting line. Its dynamic design characterizes the new Audi A1 Sportback. It is the ideal companion in the urban environment and is also very well suited for longer journeys. With its infotainment and driver assistance systems on a par with the full-size class, the A1 Sportback is firmly networked with the digital world. New trim lines provide ample opportunity for customization. New Audi A1 Sportback – ideal companion for an urban lifestyle. Eye-catching, masculine design with taut lines. Infotainment concepts from the Audi full-size class. New driver assistance systems for more safety and comfort. More style. More technology. More fun. The new Audi A1 Sportback. The new Audi A1 Sportback combines dynamic design with everyday practicality. It is the perfect urban companion that doesn’t compromise on style or detail. The new refined interior offers new levels of spaciousness and comfort, making it the perfect drive for longer adventures. 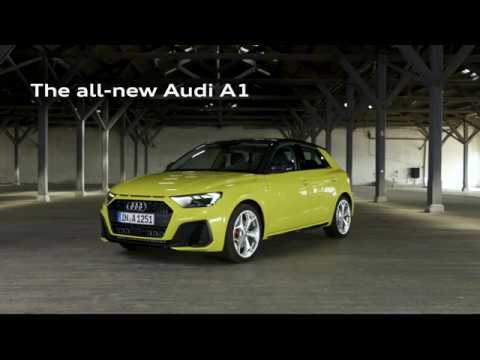 The new A1 Sportback is available in a choice of 10 colours. Multiple customisation options are available too, including the option to pick a contrasting colour for the roof, side front spoiler lips and side sills. The exterior: striking by design. The low and wide singleframe grille and the side air inlets dominate the distinctive front. Below the edge of the hood are three flat slits – an homage to the Sport quattro, the brand’s rally icon. The eye-catching new design isn’t all that is on offer. The A1 Sportback offers an extraordinary listening experience too. The rigid body and uncompromising build quality guarantee a sporty driving experience with minimal interior road noise. Fully connected: brains and beauty. Full of intelligent technologies, the new A1 Sportback combines brains with beauty. This includes a high-resolution all-digital instrument cluster, 10.25 inch display, multi-function steering wheel, touchscreen controls, key-less go and smartphone interface - to name just a few. The drive: sporty and poised. The new A1 Sportback doesn’t compromise on driving dynamics. Expect agile handling and a sporty, poised driving experience. Driver assistance systems: keeping you out of harms way. As you would expect, the A1 Sportback is available with the latest driver assistance systems and safety technology. This includes pre-sense, lane assist, adaptive speed assist, reversing camera and rear parking sensors. The new A1 Sportback has grown by 5.6 cm in length making it more spacious than its predecessor. There is more room for luggage too, with capacity increasing by 65 litres. Driver and front passenger, front side and head airbag system with passenger side de-activation. To find out more about the new Audi A1 or arrange a test drive, please get in touch with our Sales Teams in Audi Ballina, Sligo and Galway.